As a team we like to eat our own dog food, so after we launched the new Intranet last month we wanted to check how well it meets the 26 points in the Digital by Default Service Standards. Assessments are not mandatory for internal facing services like this, but in the spirit of best practice we did one anyway. We’re proud that we passed the assessment and had received lots of positive and constructive comments from the assessment panel. 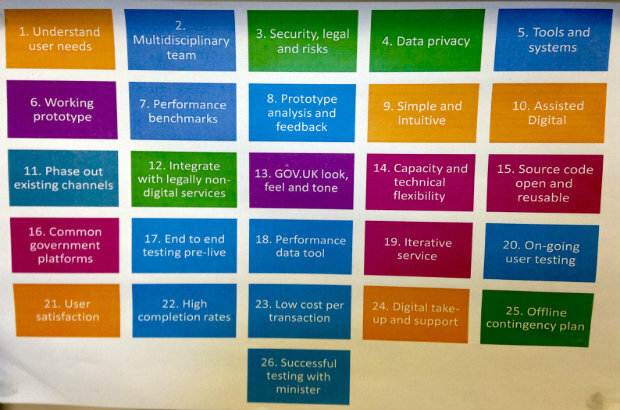 You can read the full report on the Government Digital Service’s blog. Assessments on larger services that are (likely) to have above 100,000 transactions per year are mandatory before a service goes live and run by GDS - see their guidance on how to arrange. For smaller services managing less than 100,000 transactions per year departments need to organise assessments themselves, known as Self Assessments and Certification. GDS run half-day training sessions on Self Assessments; get in touch with them to sign up. It’s really up to each department how they arrange Self Assessments, but here’s some quick guidance based on how we did it for the DH Intranet. You’ll need an Assessment Panel - we used 2 people from outside our Department. We recruited a friendly contact from another Department, and someone I’d met on my Self Certification training at GDS. One person will be the Lead Assessor. The Service Team - the Service Manager plus 3 or so key people from the team. We invited the product owner, the content lead, and the project lead. We asked the Service Team to prepare a short demo of the service (both front-end and back-end) to last no more than 15 minutes. The prompts and evidence form is really all the Service Team needs to prepare for the conversation that follows the demo. The assessment panel will use the prompts to ask about each point, and the service team should be able to provide the evidence to support their responses. The Lead Assessor writes up the report, checks it with the other assessor/s, and then submits it to the relevant Digital Leader for sign-off. Once approved the report will be published on the GDS blog.